Ah, summer, a time to go outside and get some fresh air while experiencing the wonders of nature, or stay inside and play video games. Hopefully, it’s a good balance between the two. Although the most anticipated games tend to come out closer to the winter holidays, the summer months always have a few gems. Last summer, The Witcher 3: Wild Hunt was released in May and look at all the awards it got. Sitting down to play some video games is also a great way to relieve stress from summer jobs or classes, and it always works even better when you have a completely new world to explore or a familiar one to delve back into. Here’s a few games I think are worth looking into for your summer gaming experience. First on this list is Battleborn, coming out right before the end of the semester. 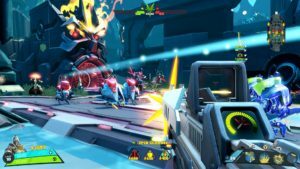 I’ve never been much of a fan of multiplayer FPS’s but Battleborn deserves some props because it’s not your standard, run of the mill game of that genre. Developed by Gearbox Software, creators of the Borderlands series, this game takes the cake because it also incorporates elements of a MOBA into the gameplay. The game features 25 playable characters each with their own unique skills, weapons, and playstyles. There is a leveling system in game in which players choose new abilities from a skill tree with each level earned. Just like a MOBA, this resets at the end of every match. Multiplayer matches are 5v5 and game mods contain many mechanics associated with MOBAs. If you’re not into multiplayer, the game also features a campaign mode that can either be played solo, splitscreen, or online co-op. Gearbox Software has also become known for the standout art style that they used for the graphics of the Borderlands series, and Battleborn isn’t just a reskin. As you can tell from the picture below, it has a unique style all its own. If you like turn-based strategy games, real-time tactics games, Warhammer, or all three, this is the game for you. From its humble beginnings, the Total War series has come a long to what I’d consider the best series of RTS games out there. Total War games not only focus on battles and commanding units in single player or against someone in multiplayer, but also have a campaign/story mode where you pick a faction and work towards conquering the other factions on the map. You also must govern your territories, build armies, and defend yourself from the other factions in a turn based system. 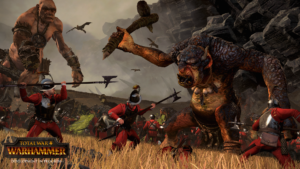 Total War tends to focus on historically accurate time periods and factions/countries, so Warhammer will be their first time stepping into the world of fiction. This is the first game of Total War’s Warhammer trilogy. This is my most anticipated game of the summer, and hopefully the true gem of the season. 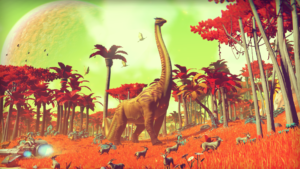 No Man’s Sky is a game I’ve been looking forward to since its announcement, and here’s why. No Man’s Sky, produced by indie game studio, Hello Games is something incredibly unique both in genre and especially in the way the in-game world is produced. It has been dubbed as a sci-fi adventure survival game, but is much more than that. The player controls an explorer of an uncharted galaxy in first person. The player can travel through space in a ship, explore different planets on foot, and trade resources that they gather, along with battle in space. The game is set online in a shared open-world or galaxy in this case. When I say galaxy, I really do mean galaxy. Yes, the game is that big. Although it’s not as truly infinite as the game’s description may imply, it is close to it, especially in terms of a game world. The way this is done is by procedural generation. This means that everything: stars, planets, creatures, ecosystems, and even the factions within the game are determined through algorithms and random number generation. So everything that is seen within game is randomly produced. Although the game is incredibly artistic in looks like the planet pictured below, these algorithms do adhere to rules that are very similar to the way actual solar systems and galaxies work. For example, these solar systems have different habitable zones depending on type of sun that is produced there, or may not have one at all. I don’t know about you, but I’m definitely excited to explore a galaxy of supposedly 18 quintillion randomly generated planets.